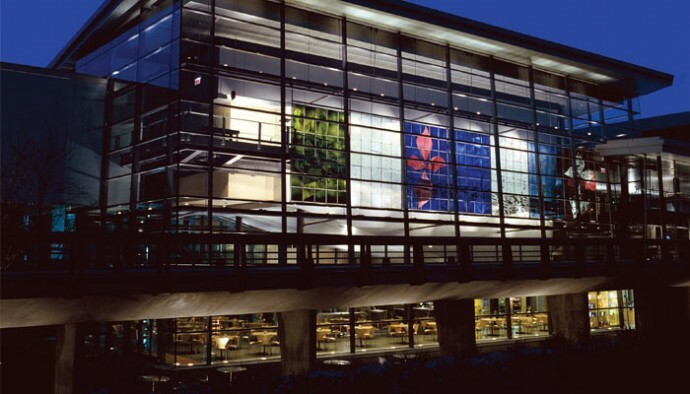 The “new” Corning Museum of Glass after its $65 million renovation in 2000. The current facade makes innovative use of glass architecture and encompasses and enhances the original museum building. Entering the lobby at the Corning Museum of Glass is like walking into a great, glistening cave – created by enormous sheets of glass cleverly held in place by nearly invisible wires. There’s no doubt the subject is glass. That’s what the founders had in mind when the original museum opened to the public in 1951. Even then, the 2,000-piece glass art and history collection and the extensive library of glass-related books and documents comprised one of the world’s foremost collections – all to be used in a unique museum that would educate the public about glass. Many years and a few redesigns later, the Corning Museum of Glass is still widely recognized as the world’s premiere glass museum. However, the new museum, which underwent a six-year, $65 million renovation in the mid-1990s, is bigger and better than before. The 200-inch Palomar telescope blank disk that many remember from childhood visits is still a dramatic centerpiece of the museum and you can still see glassmakers working the Steuben factory floor. But, now housed within a substantially larger and dramatic building, the Corning Museum of Glass has grown almost exponentially – both in the scope of its collection and in the way it approaches the subject of glass. The glass art and history collection now numbers more than 35,000 rare and spectacular objects and also includes a considerable grouping of dynamic contemporary studio pieces. The Contemporary Gallery fills the original space that once housed the museum’s entire collection. It’s a quiet gallery where the modern ferment in glass art is reflected in a dazzling array of glass sculpture art. Here are striking examples of work by masters from around the world, pieces that will hold you in awe at the glass artist’s skill. The objects range widely in size, color and concept. Some address deeply personal topics; others are more lighthearted in nature. None are boring. When you leave the gallery, you’ll step back in time to see where these inspirations in modern glass began. The Art and History Galleries provide a tour of 35 centuries of glassmaking around the world. Precious, often beautiful objects surround you, ranging from the tiny head of an ancient Egyptian pharaoh to a lovely Roman cup. Here, see a cut glass masterpiece from France; there, impressive Tiffany stained glass windows. The collection of the Corning Museum is so extensive that the majority of rare pieces in the show will come from it; however, many key objects are on loan from such major institutions as the Louvre, the British Museum and The Metropolitan Museum of Art. The technology story is told in an Innovation Center that weaves a compelling, high-tech spell with stories and interactive demonstrations. You meet the inventors who discovered important truths about glass or found ingenious ways to shape it into windows, bottles, optical instruments and even optical fiber. Clever interactive exhibits make all this fascinating and fun for young people as well as adults. It is the craft of glassmaking that perhaps mesmerizes visitors most. One of the most memorable experiences at the museum is to sit a few feet from skilled craftsmen as they shape molten glass into beautiful objects in the Hot Glass Show. You feel the heat from the furnace and watch red hot glass being cleverly coaxed into shape by the glassblower’s tools and puffs of breath. “Visitors love this part of the tour,” says Steve Gibbs, manager of the Hot Glass Show. “Some of them will sit through two or three shows before they move on. Each step of the age-old process is explained by an on-stage narrator while video screens show you the 2,300 degrees Fahrenheit interior of the reheating oven through glass used as windows on the Space Shuttle. One of the most popular features of the Hot Glass Show is “You Design It; We Make It.” Children are invited to make a drawing of an object for glassblowers to produce from molten glass. During the summer, glassmakers choose a design or two each day and the lucky young artists can see their design made from start to finish – right before their eyes. The stage overlooks the working floor of the Steuben glass factory. As they leave the Hot Glass Show, visitors are invited to watch Steuben experts form and engrave fine crystal. This empties out to the Glass­Market where seven distinct shops reflect every aspect of the Museum, from art glass to telescopes. Hot glass is also shaped here on a smaller scale by a flameworker. Using a hot torch, the worker uses fire-softened rods of glass to create perfect little animals while carrying on a conversation with onlookers. Once inspired by the museum’s collection and live glassmaking demonstrations, visitors are encouraged to go across the museum’s campus and (for a small fee) make their own glass souvenir at a walk-in workshop at the museum’s studio, where both ordinary citizens and internationally known artists work with glass beside glowing hot ovens. The Studio is recognized as a major center for serious glassmaking studies. However, it also invites beginners to try their own hand at glassmaking. They choose from projects such as making glass flowers, flameworking a bead or sandblasting a design into a piece of glass. Visitors come to Corning from across the country and other nations to do just that. The Museum is a key attraction of the Finger Lakes region and a top destination for all those traveling between Niagara Falls and New York City. Attendance has been boosted lately by free admission for children 17 and under. The Corning Museum of Glass is more than a tourist destination. It is also a core resource for people of the region, a frequent destination of class tours from area schools and the site of year-round events for both adults and families with children. An example is the regular, free “2300o” events that bring big regional crowds to enjoy glass art happenings, music and refreshments. The museum’s mission is to tell the story of glass as it’s never been told before. David L. Pierce is a freelance writer who began visiting Canandaigua Lake more than 25 years ago and was captured by its beauty. He has been living there since 1986.